“Holland creates Space”: the theme for the Netherlands Pavilion at the 2000 World Expo in Hannover was intended to showcase a country making the most out of limited space. Six stacked Dutch landscapes form an independent eco-system communicating Dutch cultural sustainability: the combination of progressive thinking and contemporary culture with traditional values. The architecture suggests Dutch open-mindedness whilst referencing stereotypes associated with the Dutch landscape: tulips, windmills and dykes. Can an increase in quality of life be maintained as population densities increase? Moreover, what conditions should be satisfied before such increases in density take place? What role will nature, in the widest sense, play in such an increase in density? Is not the issue here ‘new nature’ literally and metaphorically? The Netherlands Pavilion at the 2000 World Expo sought to reflect on this ‘new nature’: a mix of technology and the natural, emphasizing nature's make-ability and artificiality. In contrast to the nostalgia evident in many participant’s critiques of technology and the consumer society, of asphalt and machinery MVRDV’s pavilion revealed that technology and nature need not be mutually exclusive; that they can - and should - reinforce one another. The idea of arranging nature on numerous levels acts as both a continuation of the existing landscape and a symbol of its artificiality. Expo 2000 provides multi-level public space as an extension to existing public spaces. At ground level it allows for visibility and accessibility, for the unexpected, for “nature” whilst spatial events and cultural events populate it in section. It exists as a monumental multi-level park that takes on the character of a happening. 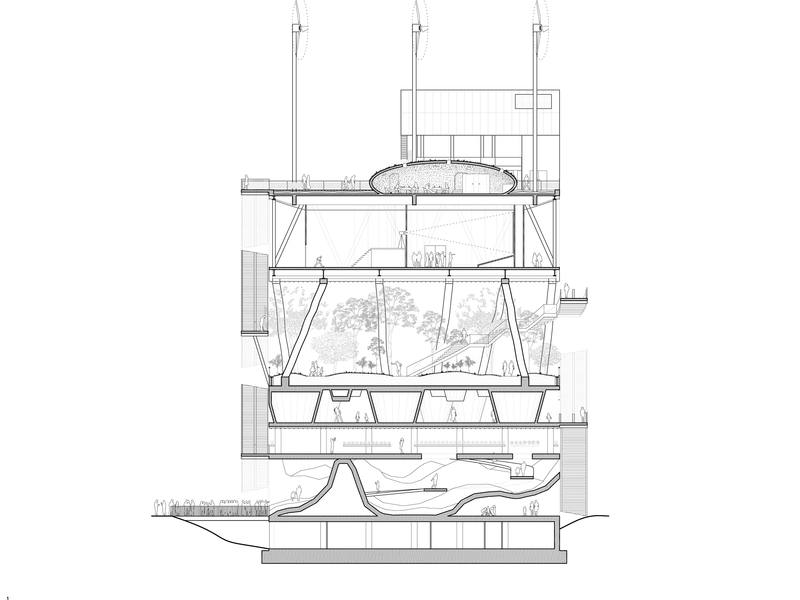 At its conception Expo 2000 presented a yet untested typology and thus functioned as a laboratory; an experimental landscape. The proposal not only saved space but saved energy, time, water and infrastructure. A mini-ecosystem or future survival kit it explored how to ensure adequate light and address a lack of land. Expo 2000 is as a symbol for the multi-faceted nature of society: it presents the paradoxical notion that as diversity increases, so too might cohesion. Japan Pavilion, Expo 2000, Hannover, Germany, 2000. 1:15 Scale.